England produced another hopelessly disjointed batting effort before seeing off Bangladesh by four wickets to keep their World Cup dream alive, for now. After Michael Vaughan had won the toss, their bowlers had first use of a wicket with a surprising amount of pace. And they produced the goods to bowl out Bangladesh for 143 in barely 37 overs, despite Saqibul Hasan's unbeaten 57. But although Bangladesh also bowled well, England fell over the line after collapsing from 70-2 to 110-6. Paul Collingwood and Paul Nixon used their collective experience to nurdle the winning runs in a stand of 37 after Mohammad Rafique had bowled both Andrew Flintoff and Ravi Bopara with his arm ball. The shot that finally relieved the pressure was a punched off-drive for six off Nixon that left just eight wanted. And victory was sealed when Nixon, who had played four attempted reverse sweeps for an aggregate of four runs, hit a conventional pull for four with just over five overs remaining. 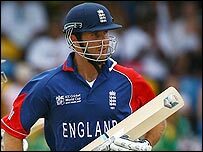 Vaughan top-scored with 30, while two batsmen got out in the 20s, Flintoff and Andrew Strauss, when they should have gone on to play long innings. It was a horribly tense affair for much of the chase, however. And it should not have been like that on a wicket that, far from the slow turners of Guyana and Antigua, was ideally suited to England's style of cricket. It being Barbados, there was also a huge contingent of English holiday-makers in the stadium, but they had a sweaty afternoon - and it was not just because of the hot weather. Sajid Mahmood quickly discovered that back-of-a-length bowling was the way to go against batsmen with uncertain footwork against pace. In his first over, the second of the match, Tamim Iqbal fended a delivery away from his body in uncomfortable fashion to offer an easy catch to gully. The Lancashire paceman should have had the other opener, Shahriar Nafees, caught at mid-on in his third over, but Michael Vaughan spilt the simplest of chances. The same delivery did provide a wicket, however, in peculiar circumstances. Disgusted with himself, Vaughan flung the ball straight to Nixon, who ran out Habibul Bashar by yards. The non-striker had loitered in mid-pitch assuming the catch would be taken, while Nafees ran to safety at the far end. Nafees could not stand Mahmood's pace and bounce for long, however. Sure enough, he was taken at second slip by Strauss, but even then England were fortunate with Nixon having parried the initial chance. When Flintoff bowled Mushfiqur Rahim in his first over to make the score 40-4, any score much in excess of 100 looked unlikely. But the left-handed Saqibul had other ideas. He hit two cut shots for four before flaying a wide delivery from Flintoff over third man for six. Saqibul continued to play positively, despite James Anderson picking up a couple more wickets at the other end via Nixon catches. Anderson's haul included the vital wicket of Mohammad Ashraful. The diminutive right-hander, who hit 100 in Bangladesh's famous 2005 win over Australia and 84 last Saturday in the victory over South Africa, contributed a solitary single this time. Saqibul and Mashrafe Mortaza put on 47 in watchful fashion before the spin of Monty Panesar provided three further wickets with Bangladesh attacking him in vain. Mahmood returned to have Syed Rasel caught in the slips and end the innings, meaning England had to bat before the dinner break. It was not the smoothest six-over period for them. Vaughan was dropped by wicket-keeper Mushfiqur on five and survived two lbw appeals as Mortaza and Rasel found some swing, albeit at a gentler pace. And Ian Bell, on his 25th birthday, was caught at point playing a loose drive. When the innings resumed after the interval, a cautious period was interrupted when Strauss pulled Mortaza for six and cut him for four in the same over. But the bowler had his revenge when Strauss was trapped on the crease to be lbw. Vaughan was making slow progress at this point, and when he eventually tried something aggressive he top-edged a sweep off slow left-armer Abdur Razzak, departing on 30. 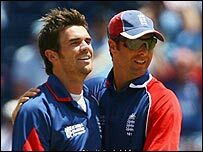 Razzak was also the bowler when Kevin Pietersen, who had faced 24 balls without hitting a boundary, chipped a catch to short mid-wicket. The score was 79-4 and England were under a bit of pressure. Flintoff, coming off scores of two and four, hit Rafique, the second of three slow left-armers, for two fours and one massive six. But just as the Lancashire all-rounder looked ready to play the defining innings of the match, the bowler had his revenge. Rafique struck again when a leaden-footed Ravi Bopara played a delivery back onto his stumps. Thereafter, it was all down to Collingwood and Nixon. And thankfully for England fans, there were no more wickets, though there were one or two heart-stopping moments. A turning point for Samuels?